A rain garden is made by creating a shallow depression in the earth that will capture and use rain-water runoff from roofs and driveways. Rain water run off contributes to water pollution if allowed to run off into the surface water. Plant trees, shrubs, flowers, ferns and other plants that have large root structures that can reach way down for water and are able to withstand brief periods of flooding and dry conditions. Sweetgum (Liquidambar styraciflua) is also known as redgum and is a member of the witch hazel family. The tree grows as tall as 100 feet with star-shaped leaves that are 4 to 7 inches in diameter and turn deep red or burgundy in the fall. The flowers are inconspicuous, but are followed by hard, spiny seed pods the size of golf balls. Plant sweetgum in full or filtered sun and a moist, well-drained soil. The tree is hardy in USDA zones 5 to 9. Interrupted fern (Osmunda claytoniana) is hardy in USDA zones 3 to 8. The plant grows from 2 to 5 feet tall and about the same in width. Interrupted fern gets its name from the spore-bearing leaflets that interrupt the fronds in the middle. Plant interrupted fern in partial to full shade and a soil that is moist to wet. Bunchberry dogwood (Cornus canadensis L) is a ground cover that grows from 3 to 6 inches tall. It has oval-shaped, dark-green, pointed leaves that grow in a circle around the top of the stems, with a dogwood blossom consisting of a green center and white or pink petals in the middle of the leaves. The tree blooms from May through September. The green center becomes a cluster of bright red berries and the leaves become a red-wine color in the fall. Plant bunchberry dogwood in full sun, partial shade or full shade and a soil that is moist to damp and cool. The plant is hardy in USDA zones 1 to 9. Pinxterbloom azalea (Rhododendron periclymenoides) is a deciduous shrub that is hardy in USDA zones 4 to 9. The plant grows from 3 to 6 feet tall and 4 to 7 feet wide. White, lavender or pink funnel-shaped flowers grow in clusters and bloom in April and May. Oblong or elliptic-shaped leaves appear after the flowers. 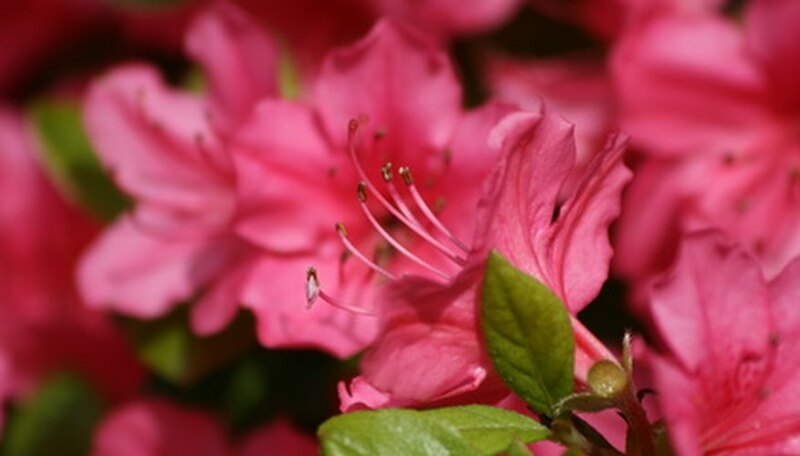 Plant pinxterbloom azalea in full sun or partial shade and a soil that is moist and well drained. Downy serviceberry (Amelanchier arborea) is also known as juneberry, shadbush, servicetree and sarvis-tree. The plant is a large shrub or small tree that grows from 15 to 25 feet tall. The tree produces medium-green, elliptic-shaped leaves measuring from 1 to 3 inches long that turn yellow-orange to red in the fall. White flowers grow in clusters from 2 to 4 inches long blooming in early spring. The flowers are followed by red berries that ripen in June and are a favorite meal for birds. Plant downy serviceberry in full sun or partial shade and a moist, well-drained soil. Are Hibiscus Plants Poisonous to People? Do Nonvascular Plants Have Seeds?